A secondary area of low pressure will slide through Northern Illinois Friday morning. This will not only bring light rainfall to Northern Illinois and Southern Wisconsin, but also pull down a colder air mass for the afternoon. Scattered showers will last into the afternoon with a cold front, but just enough instability may be present in the atmosphere to produce a few isolated storms. 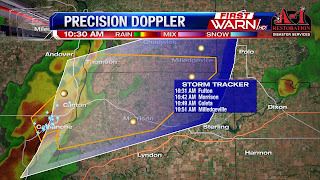 Severe weather isn't expected, but some storms could contain small hail or graupel (soft hail). Most times during thunderstorms the freezing line, or point in the atmosphere where the temperature drops below 32 degrees, is several thousand feet above. With the cold air arriving Friday afternoon, the freezing line will be lowered as colder air tries to move down to the surface. Water droplets within the atmosphere and the cloud won't have to travel very far up before freezing. The rain that occurs within the downdraft of the storm will help bring those hail stones down to the surface. 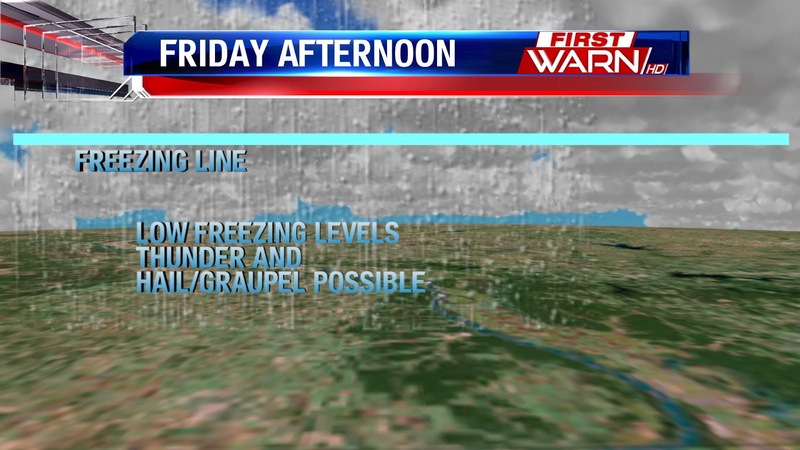 So don't be surprised if there is very small hail with any rain showers Friday afternoon. Several cold fronts will move through the northern tier of the country over the next week. The first one came through today, bringing thunderstorms earlier this afternoon. The second one arrives Friday bringing with it a few more showers and isolated storms (non-severe) for the afternoon. Saturday. 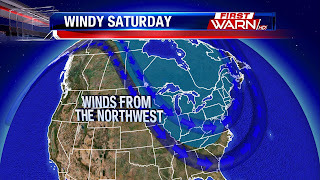 Winds all throughout the atmosphere, from the surface to the jet stream, will be positioned from the northwest. This combined with the cold air will cause winds to gust as high as 40-45 mph over the western Great Lakes. There will also be a few showers during the first half of the day, with snow flurries possible over Wisconsin. The chill won't last because winds will quickly shift around to the southwest Sunday allowing temperatures to warm into the low 50's. The third cold front will arrive Sunday night with yet another chance for showers into next Monday morning. 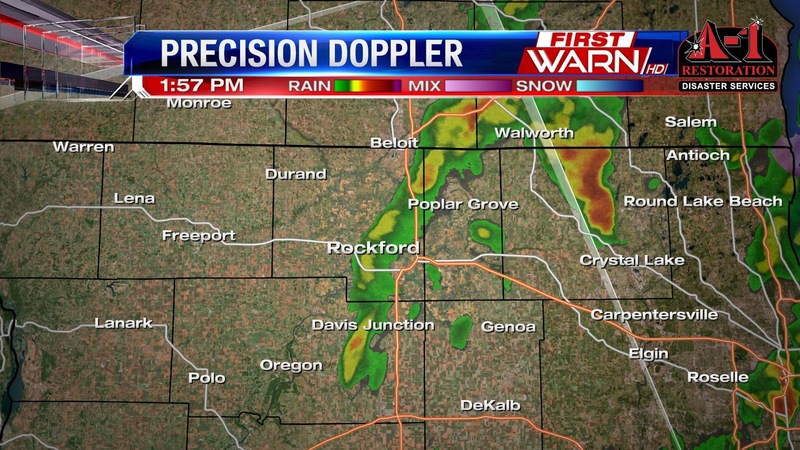 2:00pm Update: Last line of showers and isolated storms rolling through Northern Illinois. 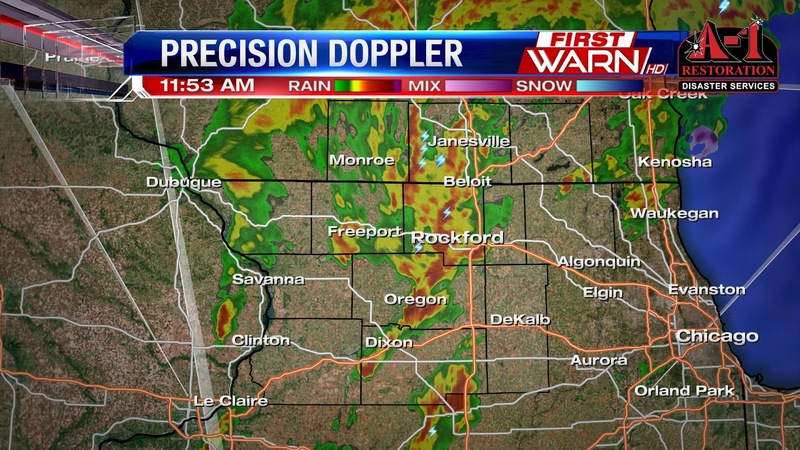 Winds are shifting around to the west, west of Rockford and to the northwest near the Mississippi River. This will cause temperatures to drop back into the low 50's and 40's for the remainder of the afternoon. 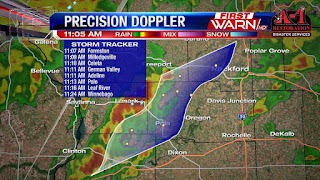 Line of storms extends from Janesville, WI to Harmon, IL. 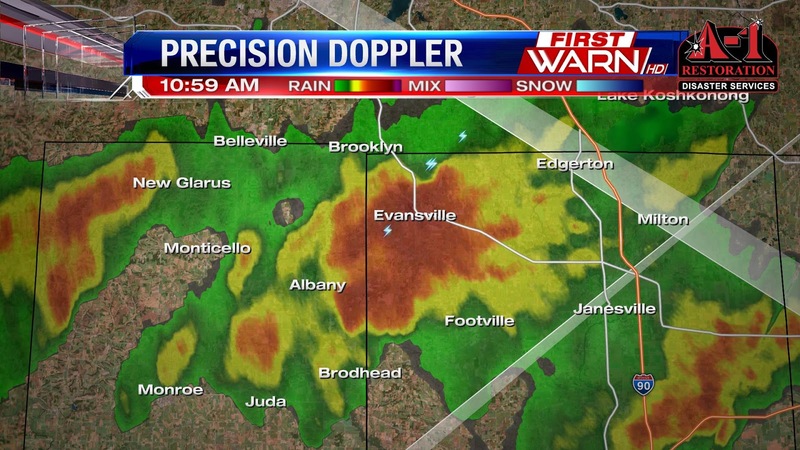 Heavy rain, thunder, and pea sized hail possible. 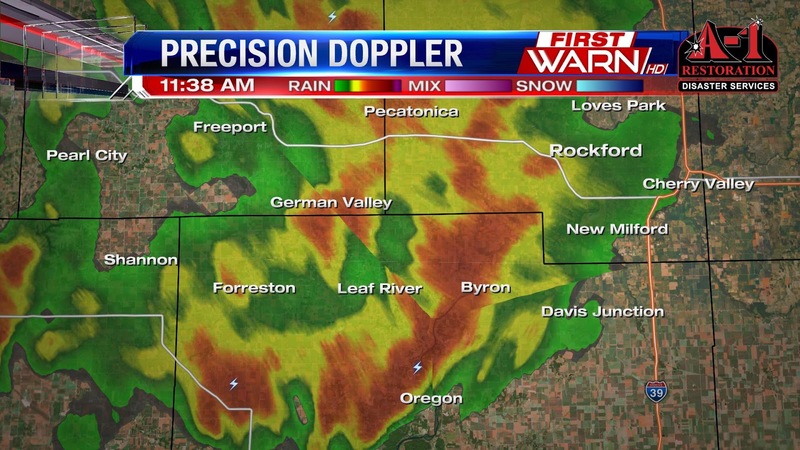 Strong thunderstorm w/ pea sized hail in Rock Co Wisconsin. 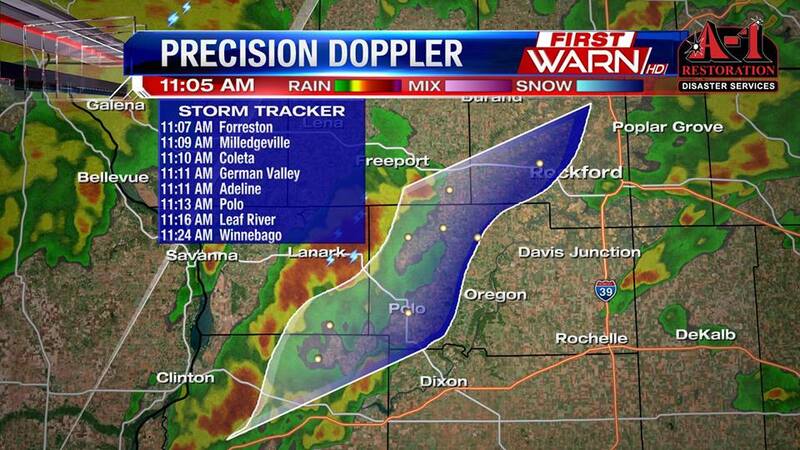 This is moving NE at 55mph. 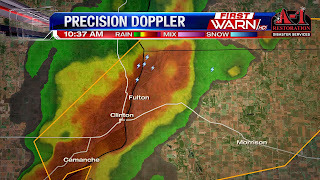 .75" hail reported in Clinton, IA with Severe Warned storm. Damage to vehicles can occur. A strong area of low pressure will move across the middle of the country bringing with it rain and thunderstorms. Storms will begin out west over the Plains Tuesday evening and slide eastward into Iowa, Missouri and Oklahoma by Wednesday afternoon and evening. Scattered showers are likely during the day in Northern Illinois and Southern Wisconsin, but the more steady rainfall will arrive closer to supper time and overnight. While a few thunderstorms can't be ruled out, it looks like the higher chance for those will arrive late in the evening. This will be as a cold front and area of low pressure move closer. With still a little instability lingering into the morning and early afternoon Thursday we can't completely rule out a few more thunderstorms developing over Northern Illinois, but it looks like the higher threat for storms will be over Northeast and East-Central Illinois. Scattered showers are possible again Friday as colder air moves into the Great Lakes. We could even get a little thunder with that, as well. The spring and fall months are no strangers to great temperatures swings within a weeks time. Take this week, for example. Highs Tuesday and Wednesday will be reaching the 60's, if not low 60's. But by the end of the week highs will have dropped into the 40's. It's very common to get these types of changes during the week as the seasons change. The atmosphere is trying to still balance itself out. Coming out of the cold winter months, the warm air mass to the south is trying to retreat back north. The larger swings in temperatures across the U.S. is what causes those large low pressure systems to form. Since wind around low pressure flows counter-clockwise, southerly winds are drawn northward. However, there is still enough cold air that often times follows the passage of the low that drops temperatures back down a few days later. Eventually, as the temperature difference between the north and south balances out those weekly temperatures swings will also even out. But until then, hold on. There is another shot of cold air that arrives over the Great Lakes and Northeast by this weekend. But by the following week, warmer air out west gets pulled back east with temperatures warming close to and slightly above average. It was a bit of a soggy Easter Sunday with rain developing in the early afternoon and lasting through about dinner time. 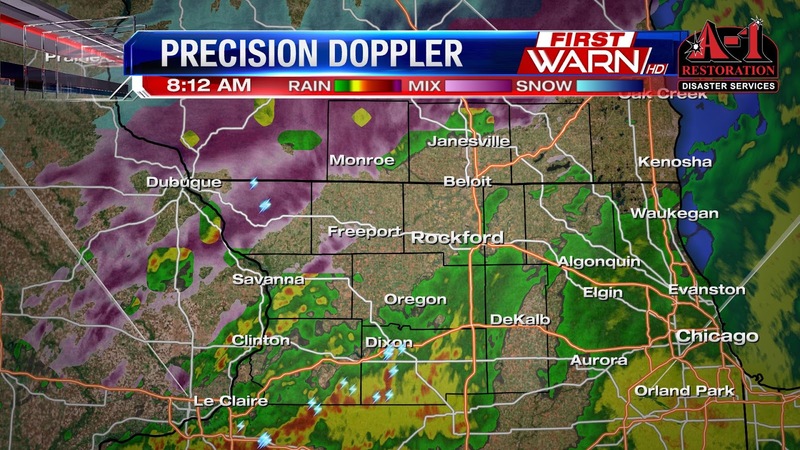 It was a colder lighter rain, but we didn't pick up much, only 0.15" in Rockford. The highest total was near Monroe at 0.25". Another system arriving midweek will bring more rain across the Midwest. A developing low in the plains will allow for rain to spread east into Missouri, Iowa, Wisconsin, and Illinois. Another 0.50" inch is possible with showers and even a few thunderstorms on Wednesday afternoon. In terms of rain totals for the month, we're actually above average. So far this March we've actually seen a wetter pattern allowing for our monthly totals to be about an inch and a quarter above average. Our monthly average is 1.95" but so far we've received 3.22" inches. With rain arriving midweek we look to end the month close to 1.5" above average. Easter is setting up to be showery, mainly from lunchtime through dinnertime. None of the rain will be particularly heavy, but it will likely be raining from the late morning hours through the early evening hours. We could see upwards of 0.1" to 0.3" of rainfall by Sunday evening, with higher totals towards Belvidere, DeKalb, Sycamore, Rochelle, and Elgin. 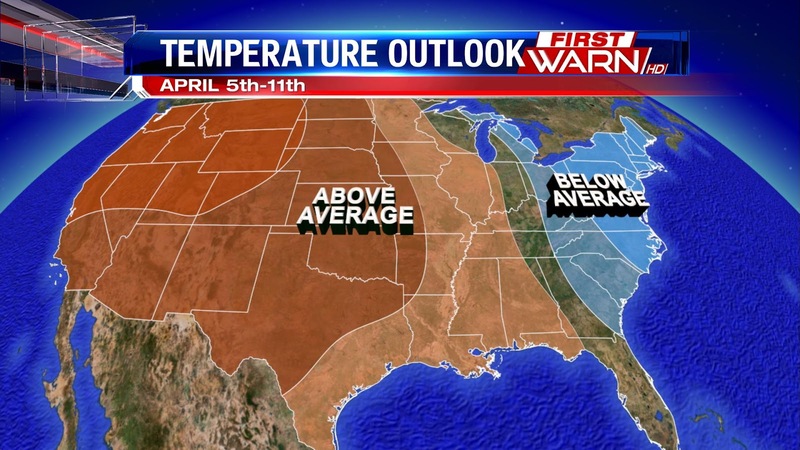 Beyond Easter, we will be seeing a moderating trend in temperatures. In fact, it looks as though 60's are likely Tuesday and Wednesday with 70's not far to the west. With the warmer temperatures will exist the threat of showers and thunderstorms on Wednesday and Thursday across portions of the Plains, Midwest, Mississippi Valley, Ohio Valley, and Great Lakes. Some of the thunderstorms that move through may become strong to severe, especially off to the south and west of the Stateline. The main threat of thunderstorms will be Wednesday late afternoon through early Thursday morning. The reasoning behind the threat of strong to severe thunderstorms is because we will have a strong cold front, a strong low, sufficient wind shear and instability, and plentiful moisture with dew points approaching 60°. If we can pull more instability and wind shear into the region, we will have a higher chance of seeing severe weather. As it looks now, stronger storms are possible on Wednesday, but the higher severe threat will likely remain just to the southwest of the region. After the thunderstorms exit, some lingering rain is likely Thursday before temperatures cool down to end the week and ring in April. We received a reminder on Thursday that wintry weather can and does happen after spring officially begins. We saw everything from rain and thunder to sleet and snow within a 12-hour span on Thursday. Friday showed us that when it is spring, the weather can do a complete 180 in just a matter of 24 hours as we saw plentiful sunshine and highs near 50°. So now that we have experienced four seasons in 48 hours, where do we go from here? Looking into Easter Weekend, it looks mild with 50's Saturday and upper 40's Sunday with a slight chance for showers on Sunday. 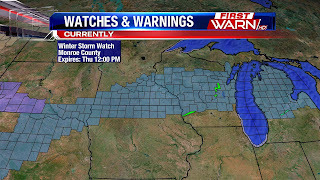 Beyond Easter, we have three large weather stories here in the Stateline. First, we will be experiencing a significant warm up Monday through Wednesday with 60's likely on both Tuesday and Wednesday. There will be 70's just one state to our west in Iowa. This warmth will be pulled north by strong southerly winds ahead of a powerful cold front that will swing through here late Wednesday night. That cold front will bring the region back to reality on Thursday and Friday with highs in the 40's. That cold front will bring with it the opportunity for showers and thunderstorms as there will be sufficient warmth and instability available for storms to develop along the front. Is severe weather a possibility? It is a little too early to answer that question with high levels of confidence, but as it appears now, it looks like we will not have a large threat for strong or severe thunderstorms. 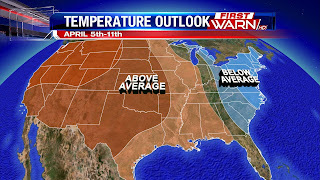 Then we look even further ahead into early April to find our third big weather story: unseasonably cold temperatures. The gates to the arctic will be open through the first week of April. This will allow very cold air for this time of the year to surge south into the Midwest and Great Lakes. In fact, temperatures are expected to be anywhere from 15° to 30° below average. That translates to high temperatures in the 30's and low temperatures in the teens and 20's. Don't let the 60's we see next week catch you off guard just yet! 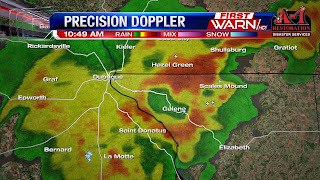 Well...we saw a little bit of every season yesterday...with reports of hail, graupel, freezing rain, sleet, snow, rain, and thunderstorms across the entire Stateline area. We do a weather 180 today with plenty of blue skies and sunshine this afternoon. High pressure builds in from the west today allowing for light southerly winds and temperatures in the mid 40's. Unfortunately the sunshine doesn't last all weekend. Low pressure system developing in the plains will increase the cloud cover into the weekend. Peeking into your holiday weekend temperatures will stay mild and slightly warmer, but we also see a few spotty rain chances. Saturday starts with a few peeks of sunshine, we'll see partly sunny to mostly cloudy skies with temperatures climbing into the lower 50's. Most of the day will be dry, but a few light showers will be possible Saturday early evening ahead of our next cold front. Temperatures fall into the low to mid 30s into Sunday morning. If you are heading out to church on Easter morning it will be chilly and you'll want a coat for that with cloudy skies and temperatures near 32°. Temperatures will make it into the mid 40s despite a passing cold front Sunday morning. You'll want to keep the umbrella handy with a few scattered showers possible into the afternoon. Messy morning for some with temperatures hoovering at the freezing mark north and west of the Rockford area and in the mid to upper 30's across the rest of the area. This is allowing for freezing rain and sleet in northwest portions of the area and then tracking thunderstorms to the south. 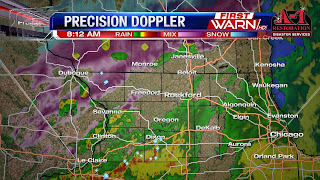 Green, Rock, Jo Daviess, and Stephenson counties have been placed under a Winter Weather Advisory. For northwestern Illinois that will be in effect through noon, Green County in Wisconsin will expire at 1pm and Rock County's advisory expires at 4pm. The advisories for far northwest Illinois are in place for sleet and freezing rain that is falling and will allow for slick areas on some roads. Also will be watching for this to switch to all snow into the early afternoon and we will see a couple inches accumulate on grassy and elevated surfaces. It will be slushy on roads but will still be creating slick roads. Southern Wisconsin will also see the freezing rain and sleet, but also see slightly higher accumulations. In general, the Stateline will see a couple inches of slushy snow accumulate around the area. However a convective band of snow also is forecast to set up near the Stateline. Within this band 2-4 inches of snow is possible. However, this is not something the entire area will see, but more so locally for a few cities. Early spring and late fall storm systems can be quite impressive, and the one affecting the Plains and Midwest is not disappointing. Low pressure in northern Kansas will continue to strengthen Wednesday night and move into Iowa by Thursday morning. Ahead of the low, strong to severe thunderstorms have developed with heavy snow falling to the north and west. Light rain will continue for northern Illinois and southern Wisconsin through the evening, although it will become more drizzle for some as the sun sets. As the low out west moves closer overnight, the rainfall will increase in intensity after midnight with even the possibility of a few rumbles of thunder by dawn Thursday. Colder air to the north in Wisconsin will allow for a rain/sleet mix as temperatures range between 32 and 35 degrees. A little lull in the precipitation is possible as the low passes Thursday morning, but with the low now slowing down and not completely moving through northern Illinois until late Thursday afternoon, this will hold on to the precipitation a little longer. Colder air will settle in behind the low during the afternoon with a transition over to snow after 2pm Thursday. Snowfall amounts won't be much as the snow will be heavy and wet, but a narrow band of heavier snow is very well possible over portions of south-central and north-central Illinois that could accumulate to a few inches on grassy surfaces. Forecast models have come into better agreement with this heavier band developing on the backside of the low pressure system. It's still a question as to *where that band will actually set up. Wherever it does develop, totals could very well end up within the 2" to 4" range. Definitely something to keep a close eye on! Soggy weather arriving to northern Illinois this morning from rain that developed in central Iowa. 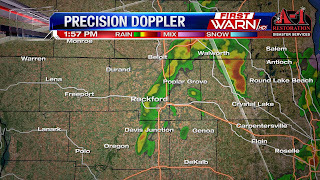 Scattered showers will be in place today because of a stationary front that has settled just south of the Stateline. 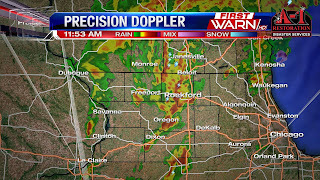 This front will act a focal point for rain, with thunderstorms possible just to the south, mainly south of I-80 and I-88. Off and rain today, but coverage picks up into the evening, and can't rule out a few rumbles of thunder. While again, the greatest thunderstorm threat remains just south of the area. The rain will continue into Thursday morning making it a soggy commute, temperatures in the afternoon with then stay in the 30's. As cold air raps in around the departing low pressure, the rain will turn into a rain snow mixture and then lighter snow through Thursday afternoon. Overall, accumulations will be minimal, mainly a dusting on grassy surfaces. A weak ridge of high pressure builds in on Friday allowing for sunny skies and mild temperatures but once again rain moves in for the weekend. Passing low pressure and cold front look to bring an uptick in showers Saturday night into Sunday morning. So the Easter Bunny may be a little delayed dropping off any eggs. Models however are still diverging on the timing of this so the timing could still change as we get closer. There will be quite the temperature difference over Northern Illinois Wednesday afternoon as a cold front settles southward between I-88 and I-88. This means brisk northeast winds over Northern Illinois will keep temperatures in the 40's, 30's further north in Wisconsin, and 50's and 60's south of the front. Wednesday will look and feel a lot different from the 60 degree weather we felt Tuesday afternoon. Clouds, drizzle and even fog will occur north of the front while a little more sun will be likely south of the front. This will also be the favored area for a few thunderstorms during the day. Cooler air comes in Thursday with highs likely settling into the 30's. A mild start to the first week of Spring, but it doesn't last all week. Turning cooler and wet on Wednesday as a stalled cold front sinks southward, bringing the rain with it. This is in connection with an area of low pressure that will strengthen in Nebraska. The cold front will stay north of the Stateline Tuesday and that keeps us cloudy but dry through the afternoon with temperatures making it into the low 60's. Overnight the front will sink south into northern Illinois by Wednesday morning.This will be the focal point for rain to develop through Wednesday. A few showers will be possible Wednesday morning but then coverage increase through the afternoon. Temperatures will be cooler than what we will see today, but still warm enough to support rain across the region, with the swath of snow in central Wisconsin north of the freezing line and low pressure track. A few thunderstorms will develop in central Iowa Wednesday afternoon and will track eastward, allowing for a few rumbles of thunder Wednesday evening. Stronger thunderstorms look to stay southwest of the region where there is better moisture and instability present. This includes western Illinois, southern Iowa, and most of Missouri. The rain will continue overnight into Thursday morning as the low pressure heads to the northeast into Michigan by Thursday afternoon. Cold air will then filter in behind the system into Thursday morning as the low passes overhead. This would allow for a change over to a winter mix and then all light snow through Thursday afternoon. With warmer temperatures profiles and not a lot of lingering moisture northern Illinois doesn't look to see any significant accumulation. Higher totals will stay north of the area where there are currently Winter Storm Watches in place through central Wisconsin. If the low pressure track sinks farther south, then the Stateline could be in line for more snowfall, make sure to check back for more updates. 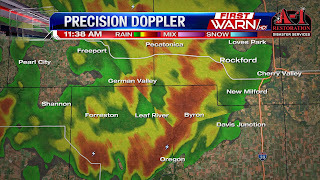 Severe weather moved through Iowa and Illinois Tuesday, March 15th. 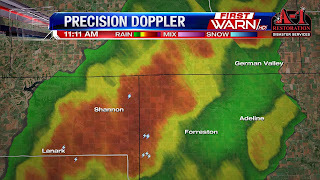 Several tornadoes were reported in eastern Iowa and west-central Illinois. 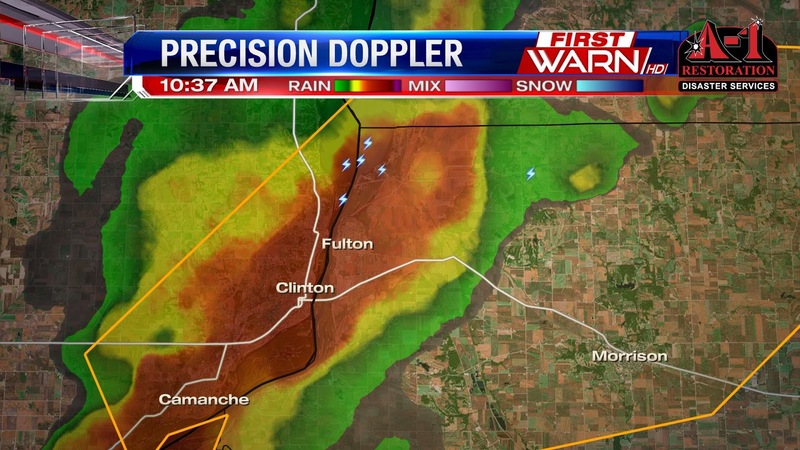 But there was one tornado that came very close to our viewing area. 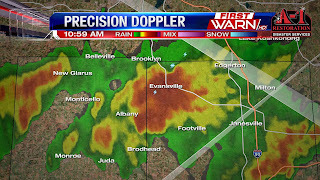 New information coming out from the Davenport National Weather Service office Friday morning shows an EF-0 tornado with winds of 80 mph occurred 5 miles north of Deer Grove in Whiteside County. According to the damage survey, the tornado uprooted a tree, damaged shingles and siding to two homes and a short portion of an irrigation rig was overturned. The tornado was approximately 50 yards wide and on the ground for 1.5 miles. It only lasted for 5 minutes. In Rockford, March averages 4.8 inches of snow. And it's not unheard of to get one, or two, bigger snowstorms during the month of March. Following Tuesday's high close to 60 degrees, a strong low pressure system will move through the Midwest beginning Wednesday. Ahead of the low, winds turn southerly giving temperatures a nice spring-like boost. However, a stationary front will settle very close to the state line Wednesday and Wednesday night. 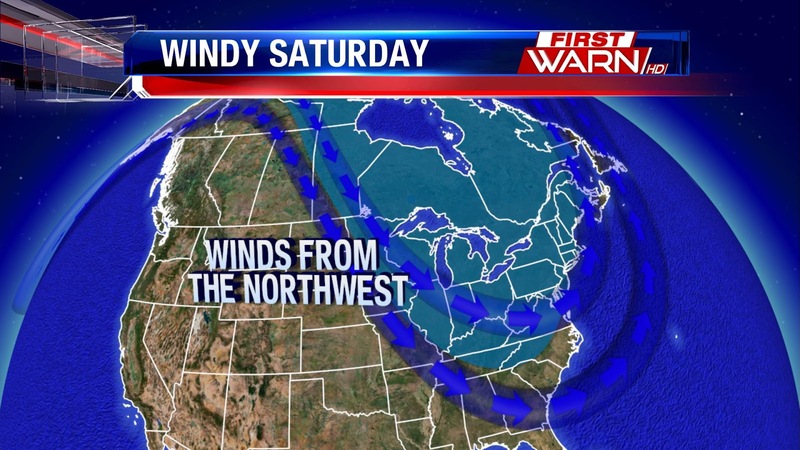 Strong easterly winds north of the front will keep temperatures in the 30's and 40's. South of the front highs will warm into the 50's and 60's. Temperatures for the area depend highly on where exactly low pressure will track. And if the low tracks to the south Wednesday night and Thursday, Thursday will be a very raw day with possibly accumulating snowfall by Thursday evening. Right now, the current storm track would take the low very close to Northern Illinois giving most of the area rain, with a mix in southern Wisconsin and accumulating snowfall north of a Madison to Milwaukee line. If, however, that track shifts southward like the European forecast model is suggesting then accumulating snowfall would occur very close to the Stateline. The first full day of Astronomical Spring began Sunday, March 20th. But spring officially began late Saturday night - 11:30pm to be exact. 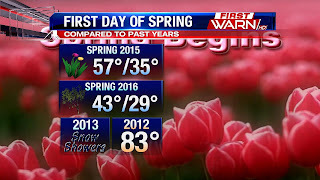 The earliest start to spring since 1896! Wow! And temperatures Sunday weren't all that bad. Highs reached 46 degrees in Rockford, just three degrees below average. For the remainder of March, the sun will rise before 7am and set after 7pm, helping temperatures warm as get closer and closer to the start of summer. However, I think Mother Nature may have something different in mind this week for parts of the Midwest. Accumulating snow looks very likely close to the Stateline. More on that in a later post! The last day of spring has delivered a reminder that it was technically still winter. Rain showers fell with temperatures in the upper 30's and lower 40's. Snow showers have been mixing in as well, especially Saturday evening as cooler air pushes in. Spring officially starts Saturday night at 11:30 PM Central Time, but the first day of spring won't feel as such. Sunday will be chilly in the 40's despite seeing some sunshine. Then our eyes will turn towards the middle of next week. 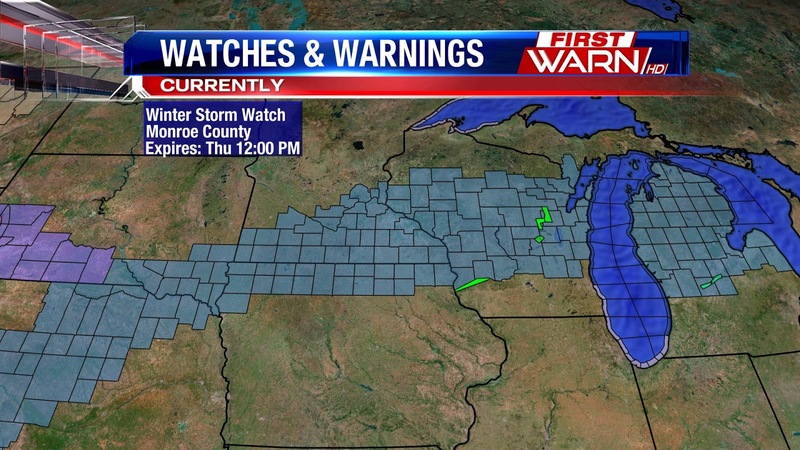 This is when the next significant storm system could affect the Stateline. A low pressure system will develop and move in on Wednesday. 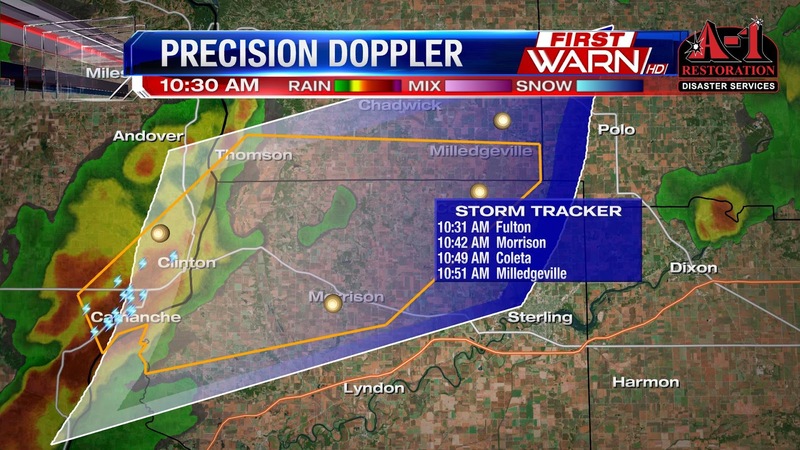 A warm front will likely set up near the Stateline, likely dissecting the region. As a result, there could be a significant temperature gradient setting up across the area. Our far-northern regions could see highs in the 30's on Wednesday and Thursday. Meanwhile, 60's will be found just south of I-88. Determining the exact temperatures we will see on Wednesday and Thursday will depend upon exactly where that warm front sets up. Regardless of where it sets up, confidence is high in a large temperature gradient from north to south on both Wednesday and Thursday. The rain will likely fall late Tuesday night through Thursday early afternoon. 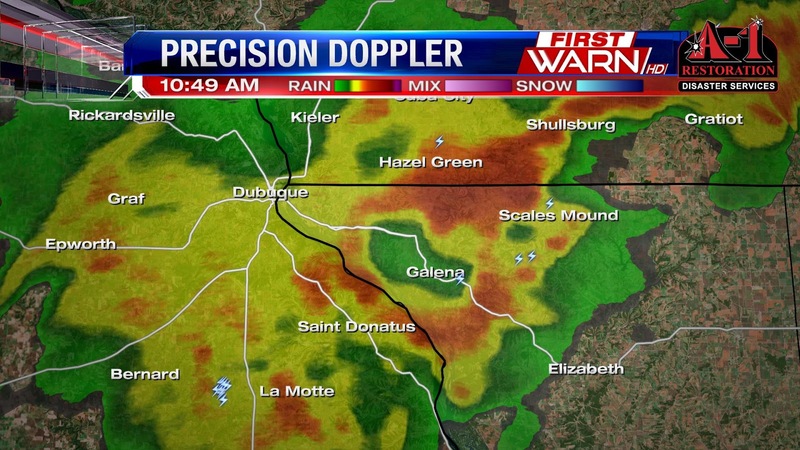 Some of the rain could be moderate to possibly heavy at times. All of the forecast models show the rain sticking around for that period of time, but they disagree on how much rainfall we could see. After taking into consideration all of the main weather forecast models, rainfall amounts will likely be in the 1-1.5" range by Thursday afternoon when the rain begins to wind down from west to east. We are now less than two days away from the official start to spring. If you look at the forecast for the next few days you probably wouldn't guess that, however. When spring begins on Sunday, highs will likely only reach the lower 40's. Last year on the same day we saw temperatures warm into the upper 50's. In fact, going back a few years to 2013, we actually recorded a "trace" of snowfall at the airport. If we go back one more year to 2012, the first of spring featured temperatures in the lower 80's believe it or not! While we will be nowhere near the warm extreme, temperatures will be cold enough early on Sunday morning to support a few snowflakes. Snow is not in the forecast, but that just goes to show that we will be much closer to the snowy end of the spectrum as opposed to the very warm end of the spectrum this year. The last day of winter is shaping up to be rather wintry with highs only in the lower 40's under a cloudy sky. In fact, a few light showers or snow flurries cannot be ruled out at just about any point during the day. Sunday won't have any precipitation, but we will again struggle to get above the lower 40's. Cooler pattern taking shape this weekend and a few flurries will be found as well. A slow moving cold front will increase cloud cover today and allow for a few spotty sprinkles. We will have to wave good bye to the 50's for a couple of days, with the 40's taking their place through Monday. There isn't a lot of moisture found behind the front, so it will be harder to get any rain from it. The cloud cover moves in with the front, and will stick around through Saturday as well. High pressure will build in on Sunday afternoon. It will be moving in from the north, so it will keep temperatures in the 40's through Monday. It will be on the chilly side in the evening as overnight lows fall into the 20's. We have just enough moisture with a stalled boundary to the south of us to allow for light rain or a light rain snow mix on Saturday. It will feel better on Sunday the first day of spring, temperatures will be similar to Saturday, but with the high pressure, we will see a lot more sunshine. I was driving back from a weather talk in Westlake Village Thursday afternoon and I couldn't help but notice how beautiful the sky looked. I've always thought cumulus clouds were fascinating to look at. Especially when you can watch them grow, and grow, and grow. And what always amazes me is when the morning starts off cloud free and by the afternoon the sky is filled with puffy, cotton ball looking clouds. Maybe some of you have even made the observation that on 'fair' weather days the cumulus clouds all seem to have flat bases and all the bases seem to be at the same height. Ever wonder why that is? There is water vapor all around us. You can't see it, but it's there. When the sun heats up the atmosphere, the air will rise. As long as the rising air is cooler than the surrounding air it is moving in to, it will continue to rise. There is a certain point in the atmosphere where the rising air (water vapor) cools and condenses into tiny water droplets - this is called the Convective Condensation Level (CCL). 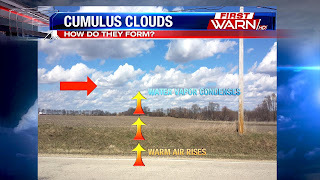 This is where the base of the cloud will form, and why cumulus clouds have their flat bases. From there, the cumulus cloud will continue to grow until it reaches a stable point in the atmosphere. Once it does, it won't rise anymore. Cumulonimbus clouds (thunderstorms) can grow to over 40,000ft in height. Sometimes, these clouds even reach the top of the troposphere if strong enough. The clouds we had today were no where near that height because there just wasn't that much instability in the atmosphere. Wednesday afternoon there was slightly higher instability which caused the late afternoon showers, some of which had pea sized hail, to form. Those did grow taller than the clouds Thursday afternoon. Return of Snow Flurries this Weekend? Sun Sets Later, Rain, and More! Time to Spring Ahead! Don't Forget! Low Chance of 1" Snowfall Here on Out? "You were so, so, so, SNOW wrong"